Heat broiler. 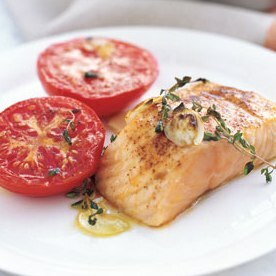 Place salmon and tomatoes, cut-side up, in a broilerproof roasting pan or on a rimmed baking sheet. Drizzle with oil and season with ¾ teaspoon salt and ¼ teaspoon pepper. Sprinkle salmon with paprika. Scatter thyme and garlic over the top. Broil until salmon is opaque throughout and tomatoes are tender, 8 to 10 minutes.